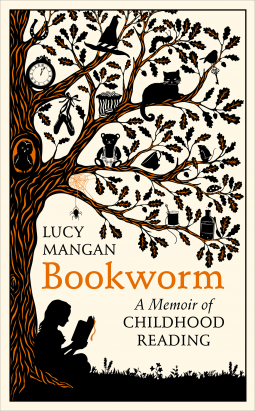 Bookworm: A Memoir of Childhood Reading by Lucy Mangan will appeal to all bookworms, but it’s more than an account of what Lucy read, it’s also a history of children’s books, details of their authors and a memoir of Lucy’s childhood. I loved it – it’s full of the joy and love of books, the intensity of reading and the ‘instant and complete absorption in a book‘. She writes with verve and humour, in a chatty style that makes it so readable. Reading her book is like being in conversation with a friend. As I am older than Lucy, inevitably she mentions books I didn’t read as I was growing up (but have read some of them in later life) , especially in the later sections of her book, books she read as a teenager, but I was quite surprised and pleased to find that our reading in early childhood was so similar, and just like her, books have made me the person I am – why else would I be writing a blog called ‘BooksPlease‘. As long as I can remember I have loved books and I can’t remember a time when I couldn’t read. So I was delighted to find that she too loved Teddy Robinson by Joan L Robinson. This is the first book I remember borrowing from the library. I loved it so much I was dreadfully upset that I had to return it. Teddy Robinson was owned by a little girl named Deborah and I am so envious that Lucy Mangan has actually met Deborah, who showed her the original drawings for the books her mother wrote. And then there are some of my most loved books when I was young such as Milly-Molly-Mandy, Alice’s Adventures in Wonderland, the Katy books, Little Women, Good Wives and Jo’s Boys, The Borrowers, the Narnia books, Ballet Shoes, and The Secret Garden. I re-read them many times over. There’s a whole section on Enid Blyton – The Blyton Interregnum. I was very interested to see her view of this writer whose books I too adored. Blyton wrote around 760 books during her fifty-year writing career! Despite the criticism of her books as mediocre material, formulaic books with fantastical plots Lucy considers, correctly I think, that they are books that provided comfort reading during and in the aftermath of the Second World War. Not only that, they are satisfying stories that lay down a base for future reading, providing books that are fun to read and opening up the ‘pleasure-filled world of reading’. Then there are the questions about prejudice, sexism, class snobbery and racism, in Blyton’s books, which Lucy (and I) missed completely whilst reading as children. She writes about re-reading the books as an adult as a ‘discombobulating experience‘ – stories that once wholly enraptured you no longer have that same magic, and about her disappointment in returning to Enid Blyton’s books and finding them unreadable. It’s the main reason I don’t go back to the books I loved as a child – I really don’t want to lose the magic they held for me then. There is so much in this book I could write about, it’s packed with the magic of books and reading it has given me hours of nostalgic pleasure – but the best thing I think is to leave you to read this lovely book for yourself. Many thanks to Random House UK for a review copy via NetGalley. I keep hearing great things about this one from people I trust, Margaret. It certainly sounds like a lovely book. And for the bookworm, what a great resource. I’m glad you enjoyed it as much as you did. I loved it for the memories it brought back! I hope you enjoy it – and remembering the books you loved as a child. Think I’m going to have get this one. Lovely, lovely post about it, Margaret. Agree with you about Enid Blyton and I absolutely adored Milly-Molly-Mandy books. it was my dad who read the Milly-Molly-Mandy books to me! I hope you love this book! Both Anne of Green Gables and Little Women haven’t lost a bit of the charm I found in childhood. In fact, I think AoGG is better as an adult. I just read about the MMM books, and ordered one of them. When we drove around England with the kids in 1992, we listened to Moonface and Saucepan and we all thought the stories were magical. Is Lucy related to the Mangan fellow in Very British Problems? Nan, I’ve never read Anne of Green Gables, but I do have a copy and it’s one of those books I keep meaning to read. I re-read Little Women a few years ago and some of the magic was still there for me – but not as much as when I was younger. And I hadn’t realise then just how much of a moral tale it is. Now I’m in two minds about re-reading her other books. I think you will love the Anne books. She’s a wonderful character. Interesting about your re-reading of Little Women. I bought the annotated version a few years ago, and look forward to it. I have been tempted to re-read some of Blyton’s books but after being disappointed by Little Women I was put off trying any more of my childhood favourites. I want to keep my happy memories too. You might try the tapes, as I mentioned in my other comment. My kids, 26 years later, still can do the Saucepan voice. Really magic. I don’t think adulthood could begin to take it away. Oh, I must have this book! I still enjoy reading children’s classics – those I’ve read as a child and those I managed to miss. But I wouldn’t reread Blyton; I think she was perfect for a given age and time and she doesn’t cross barriers in the way that some true children’s classics do. Now I’m thinking about it, there are quite a few I would avoid picking up now because I know they’re not great literature and yet they were wonderful at the time. I’d see them now for what they are and the magic of the past would be spoilt. Lovely review, Margaret! I can’t wait to read this one. It sounds like a bibliophile’s dream read! I’m sure you’d like it! This was a book I really enjoyed as well- though the EB section was something I was disappointed with because of her reaction to them as an adult- I’ve never actually stopped reading Blyton and enjoy her books as an adult as well (though I do see things that I didn’t as a child).